OPINION | I love Chicago journalism, so why won’t it love me back? A photo taken by Angie Jaime while working at TouchVision, a Chicago-based media company shuttered in 2016. 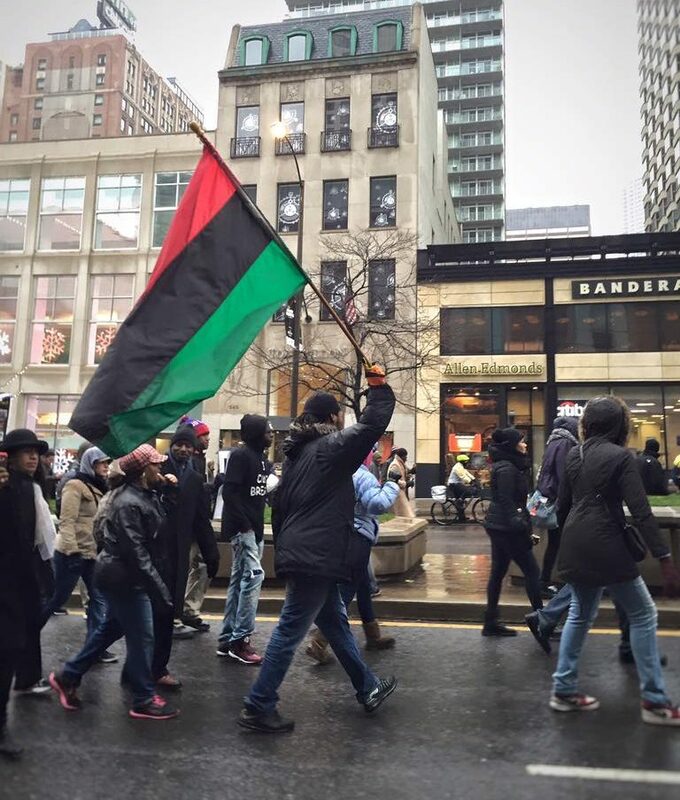 The People is our section for opinions on all things concerning Black Chicago. In this piece, Angie Jaime writes about the hostile and so-white state of Chicago journalism. A great poet once wrote, “it’s a bad religion, to be in love with someone, who could never love you,” and let me tell you, every time I think of Chicago’s media landscape, I think of these bittersweet words and they ache within me at the molecular level. I sit here writing this piece from a sun-soaked apartment in Los Angeles, a city that while I have grown to love deeply and passionately, will never occupy the same comfort of my home Chicago, with its wintry grit and glorious highs of summertime. After 27 years in my birthplace, I left for Los Angeles in the spring of 2016, recently laid off from TouchVision, a young multimedia news org where, among many other things, I helped tell and amplify Chicago stories for national audiences. It’s no secret that TouchVision was doing incredible experimental work, from its local coverage of Black Lives Matter protests to its short documentaries and news commentary segments. It gave voice and depth and much needed color to stories in an ecosystem otherwise dominated by the Sun-Times and the Trib. Shifting priorities (and let’s face it, dollars) quickly ended that productive, enriching, and thoroughly soul-fulfilling time in my life. At the end of the day, while I beamed with pride to be included among the long and rich legacy of Chicago media, I also joined them in the more recent fraught history of losing our jobs to restructuring, reorganizing and budget cuts. All casualties in this fruitless war, where media companies battle to conquer inches of the same hill. Then as now, the journalism, media, art and music that is born in Chicago has never been more vital–not just to the city, but to a nation starved for representation of the population that lives in the lands between the coasts. While the coasts have their share of issues to contend with, Chicago is the heartland’s crucible, one in which the country’s ills boil right at the surface. Yet, the creation of this journalism has never been more eroded by hostility. This month, we witnessed The Chicago Tribune’s newsroom make moves to alleviate some of this strife with an historic and dramatic move to unionize, in an effort to secure better pay and continue to tell Chicago stories. It’s just one step, but an important one in terms of fair representation for the city’s journalists. Still, the very plain truth is that the makeup of its newsroom is and continues to be so homogenous it deserves its own hashtag. On the flipside, the Sun-Times has resorted to a dramatic act of its own, issuing a blank front page and a plea to its readers to subscribe to its print edition and online content. Both moves are telling. But a drama is nothing without its setting, and in Chicago’s case, for the third year in a row, the backdrop is one of stark population decline that disproportionately affects people of color, spurred on by a mayorship that continues to favor the white, high-earning, upper-middle class at the expense of poor and working class Black and Latinx residents. We see this played out in every desperate effort to lure in big tech companies away from Silicon Valley, in every neighborhood that prioritizes high-end coffee shops over the rich fabric of communities like Pilsen, Humboldt Park and Logan Square, and in every artist, maker, creator; especially Black and Latinx Chicagoans, that are forced to leave the city they love because at the end of the day, it does not love them back enough to provide the structures to keep them. In this way, being forced to leave after losing my job in 2016, I joined their ranks as well. Of course, this holds true for the city’s newsrooms as well. Who better to tell the Chicago story, those stories which affect its considerably large Black and Latinx populations, than Black and Latinx Chicagoans themselves? As journalists, it is these very creators and makers that are much less likely to stay, not only because it is so difficult to actually find work to begin with, once they find themselves in the warm embrace of employment, keeping those precarious and rarefied positions is further complicated by navigating these largely white spaces as people of color. To be frank, Chicago’s population of color, run off by neglect and a lack of real opportunities, is a dying breed. There’s a particularly cold flavor of grief I feel when I think of how Chicago turned its back on me and other people of color. It’s more akin to the bitter, sharpness of wind to the face than, say, the dull ache of heartbreak. A shard of ice that, years later, still manages to enrage me because I can’t help but think that the persistent question, “why don’t you just stay and ‘be the change you want to see,’” is a trite oversimplification of the very real forces at play that make people like myself leave the places they love to seek success elsewhere. I am left, now, with grief, rage, and the maddening itch of unanswered questions that we all know the solutions to but don’t want to actually face. Why is it that community journalism hubs, the ones that are so much more likely to hire people of color to begin with, like DNA Info and Chicagoist, fade into obscurity, leaving large swaths of Black and Latinx stories untold? Why is it that the larger institutional news outlets cannot or will not invest in hiring and supporting diverse talent in any real capacity, leaving their newsrooms woefully incapable of telling the whole Chicago story? All while at the same time touting objectivity and impartiality (something impossible if your newsrooms are largely white and of the same socioeconomic backgrounds)? But above all—and this is the question that sears my heart and renders my mind sleepless—why is it that the seeds of Chicago’s talent can find more respect, opportunity (and dollars) in other pastures, but can’t seem to do the same in our own backyard? Angie Jaime is a writer who lived most of her life within a 40 mile radius of the place she was born. She lives and works in Los Angeles, for now.